Just this past week my wife and I met a 9 week old puppy who'd had a rough week. Attacked by a coyote, one of his hind legs had fractures in both the femur and tibia, as well as deep punctures and lacerations. He was also without a home after the attack and in desperate need of surgery. He didn't have to wait long to find a family that wanted to ensure he got the care and home he needed, he will be coming to live with us with his leg on the mend. With his experience in mind, let's discuss bone fractures in dogs. Dogs have an incredibly high pain tolerance in comparison to humans so it might not be immediately apparent that a pet has broken a bone unless you know what to look for. Most frequently with dogs, as with humans, the bones most frequently fractured are those of the limbs. When a dog fractures a bone in their limbs they are likely to hold up the leg in question, but this may not always be the case as depending on the location and severity of the break they may still be able to place some weight on the limb. If a fracture is suspected, swelling around the site and pain are most likely present. A dog with a broken bone may also become defensive as a way of protecting itself, so consider a muzzle if attempting to move or treat one with a fracture. Epiphyseal Fractures - typically seen in dogs under the age of one year, these are breaks in the soft areas near the end of the bone known as growth (epiphyseal) plates. 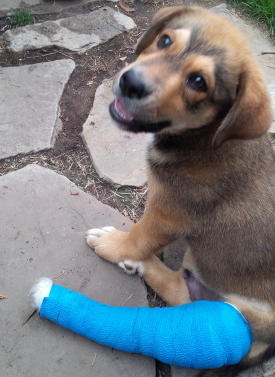 If moving a dog with a broken limb, always support the leg by using a splint or folded towel. A broken limb is an emergency situation and a veterinarian should be contacted immediately to assess the break and any other potential problems that may not be as immediately apparent. If an animal has suffered considerable trauma, a broken bone could be the least of their worries. A vet will perform an exam and probably recommend x-rays to discover the nature of the break and offer the best course of treatment. For more information on broken bones in pets, contact your veterinarian today.